I love seeing inside people homes. Don't you?! I always find myself saying, "why didn't I think of that?" Maybe that's why I pin so many amazing places and space. I'm also a shoeaholic, but we'll save that for another day. My friend Lauren sent me these photos of how she decorated with items she got from my shop. 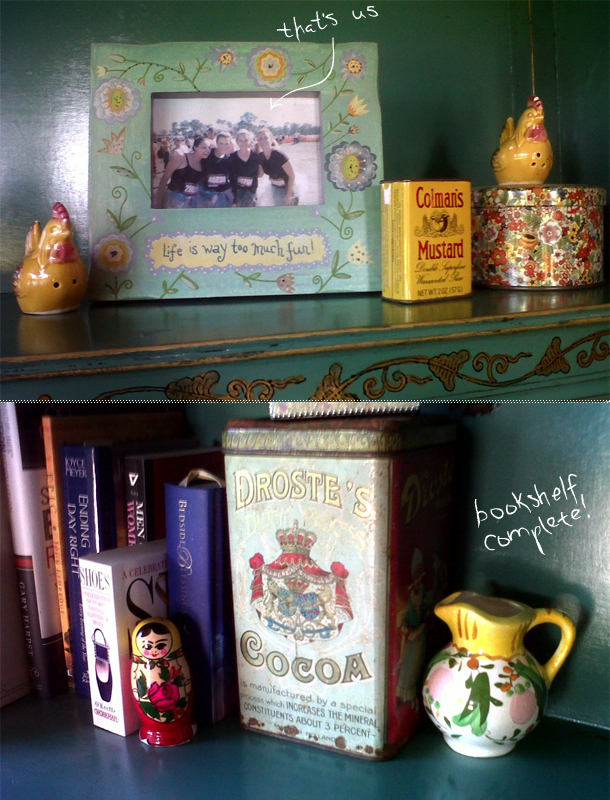 I'm going to take credit for her new-found love of vintage tins. Who said salt & pepper shakers had to go in the kitchen? Look at her stacking 'em. I love it. And using the tin and creamer as a cool bookend. She's so clever. Thanks, Lauren. You da best. Wish I could be catching lobsters with you in the Keys! That photo is us with good friends at Warrior Dash. We wore tutus to run through mud and obstacles. If you have pictures of how you styled items from my shop, feel free to email me, I'd love to see.